An unforgettable journey to one of the most beautiful valleys of the White Range (Cordillera Blanca). During the trek there are views of the spectacular Andean snow peaks such as Santa Cruz, Alpamayo, Taulliraju, Chacraraju; intense turquoise colored lagoons like Jatuncocha (big lagoon) and Ichicocha (small lagoon) and a quenoa forest, full of quenoa trees that grow only in the highlands. You will depart from Lima early in the morning in our private minibus in the direction of Huaraz (400 km). You will take the Panamericana Norte highway and turn off at the sign post for Pativilca (km. 202) where you will start your ascent into the Andes. Then, you will reach the highest point of your route; the Conococha Mountain Pass (4100 masl), where you will be able to take your first glance at the impressive White Mountain Range. 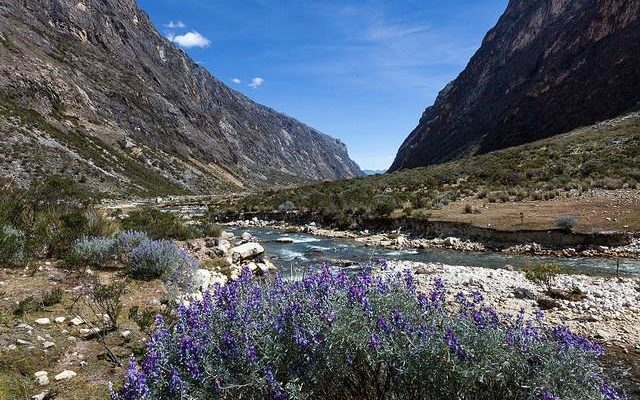 The El Santa River will follow along side you on your way to Huaraz, located at 3091 masl. The duration of travel will be approximately 7 to 8 hours. Overnight in Hotel in Huaraz. 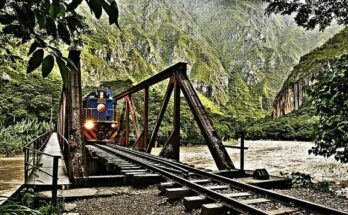 Early in the morning you will be picked up from your hotel in Huaraz and taken on a 2 hour drive to Cashapampa Village, the entrance of Santa Cruz Valley and start point of the trek. After a five or six-hour walk up a very steep path you will arrive to the first campsite, a plain called Llamacorral. Cold lunch will be served on the way. From this campsite, you will have your first view of the Taulliraju Peak, which changes to a spectacular vivid burnt orange color during sunset. Dinner and overnight at campsite. Early in the morning, after a delicious breakfast you will start walking through plains full of purple and yellow richly colored flowers, until you get to Ichicoha Lagoon. The walk continues to Jatuncocha, a beautiful lagoon. After lunch you will ascend for 40 minutes up to an excellent viewpoint where you will see the Aguja, Caraz, Artesonraju, Alpamayo and Quitaraju Peaks. 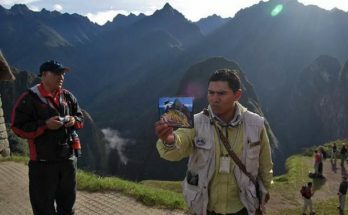 On the route, which will last from 4 to 6 hours, you will also appreciate the Taulliraju, Pirámide Garcilaso and Paria Peaks. Finally you will reach Taullipampa, a plain at the base of the impressive and steep Taulliraju Peak. Overnight and dinner at campsite. Dinner and overnight at campsite. Very early in the morning, you will have breakfast and get ready for the greatest challenge of the route; walk up to Punta Union mountain pass at 4,760 masl. Upon getting to this point you will have a priceless reward: a view of the Santa Cruz Valley surrounded by peaks of over 6,000 meters, turquoise lagoons make this the perfect place to take memorable pictures. Then you will begin your descent towards Cachinapampa, through a trail where you will see a small quenoa forest and green fields. Cold lunch will be served on the way. Arrival at the campsite 6 or 7 seven hours later. Dinner and overnight at campsite. After having breakfast you will start the last 2 or 3 hours of the trek. You will have the chance to take a look at the east face of the spectacular Chacraraju Peak. The way goes up to Vaquería, a small hamlet where the shuttle will be waiting for you to take you back to Huaraz city. On your way back, you will be able to stop at the Portachuelo mountain pass where you will have an excellent view of Chopicalqui, Huascarán, Pisco, Huandoy, Chacraraju Yanapaccha peaks and Llanganuco Lakes. 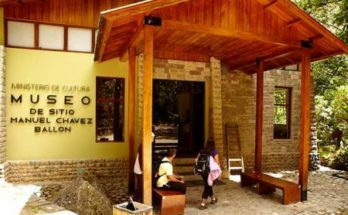 Arrival in Huaraz and transfer to your hotel. Overnight in Hotel in Huaraz. All transportation is included in private cars. Personal gear: Sleeping bag -10°C, pillow, polar interior bag, mattress and 4 seasons tents (Ferrino and Doite).